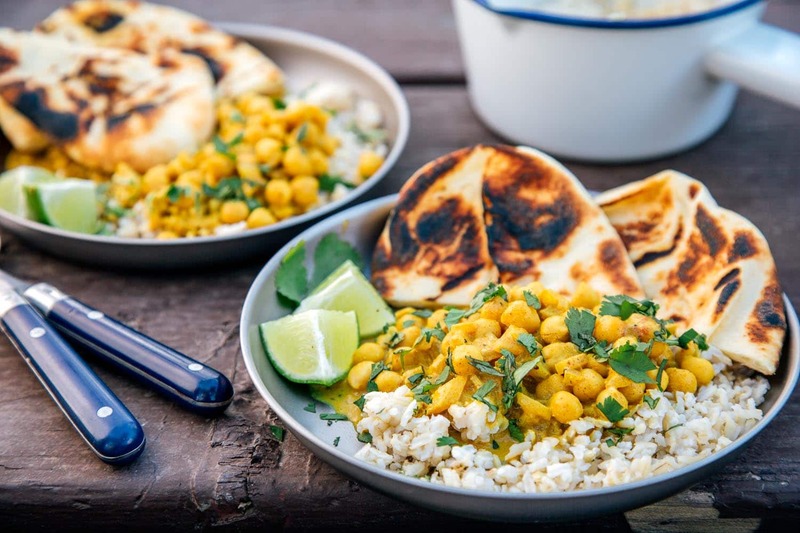 Packed with plant-based protein, completely filling, and loaded with flavor, these curried chickpeas with coconut milk continue to be a recurring camping favorite. During our first cross country road trip, we ate a lot of different versions of “rice and beans.” We didn’t have room for a cooler and we had a small grocery budget. So whatever we ate needed to be versatile, shelf-stable, and cheap. 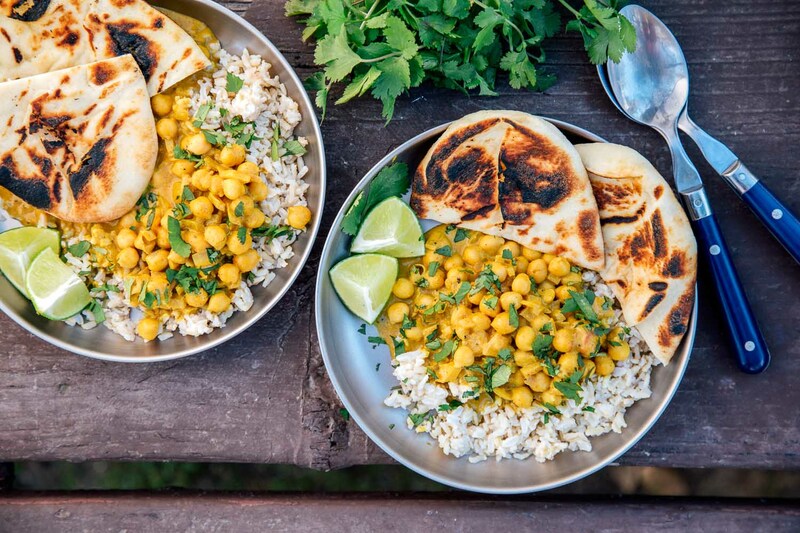 For us, this curried chickpea and rice combination really hit the spot. Back then, we would eat this meal at least once a week. But would it still hold up today? We recently revisited this meal and we’re pleased to announce: it still rocks. It was always easy to make, but we’ve reduced the prep time even more by pre-making our rice ahead of time. This can be done at home, or, in our case, in our campervan. We usually make a large batch of rice and then use in meals throughout the week. The other upgrade we made to this dish was to include some naan, which we toasted directly over the burner of our camp stove (just like you would do for a tortilla). The slightly charred crunch adds a nice bit of texture that really makes it special. 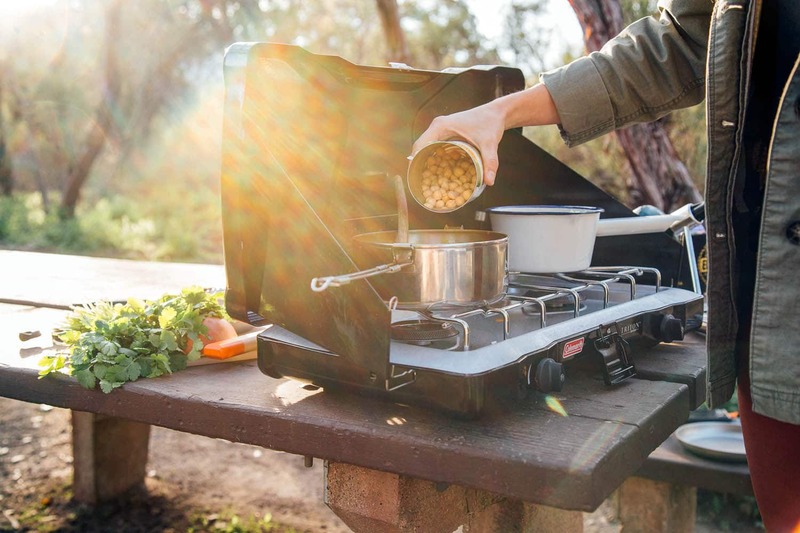 So if you’re looking for a super simple, super flavorful, budget-friendly camping meal, this is for you! We’re definitely going to work this one back into our heavy rotation. The base of the curry begins with diced onions, which get sauteed in oil until just beginning to brown. At this point, you will add all of the spices to toast them a bit, which will open up their flavors. Once the spices are fragrant, you can add in the coconut milk and tomato paste. Stir everything together until the tomato paste is completely blended into the coconut milk. Add a can of drained chickpeas, then simmer for a few minutes for the flavors to come together. While the curry is cooking, you can prep your sides – see the serving suggestions below – as well as chop the cilantro and cut a lime into wedges. Once the curry has thickened a bit, serve it over the rice with a squeeze of lime (a must! ), chopped cilantro, and, optionally, a dollop of yogurt (dairy-free yogurt will keep this meal vegan, or Greek yogurt is a great option if you eat dairy). Most nights, we serve this curry over rice. You can bring pre-made rice from home and heat it in a small pot while the curry cooks (or add it directly into the curry towards the end to cut down on dishes to wash!) 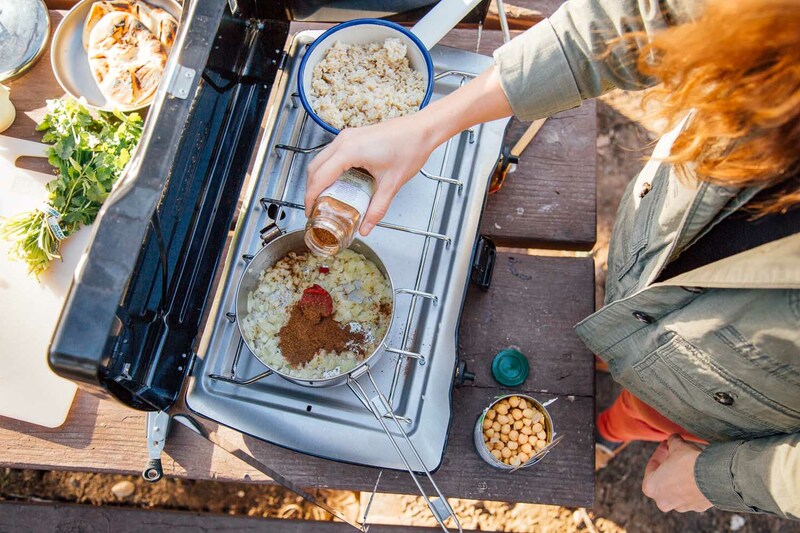 If you haven’t pre-prepared anything at home, you can make a portion of rice on the second burner of your camp stove. Alternatively, you could serve this curry with cauliflower rice. We also really enjoy this curry with naan. 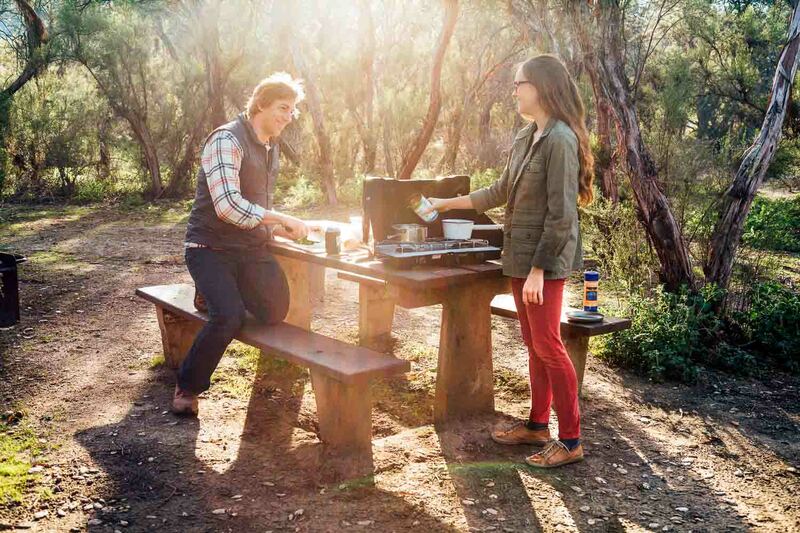 Simply toast the naan over the open flame of your camp stove or campfire, using metal tongs to flip frequently so it doesn’t catch on fire. 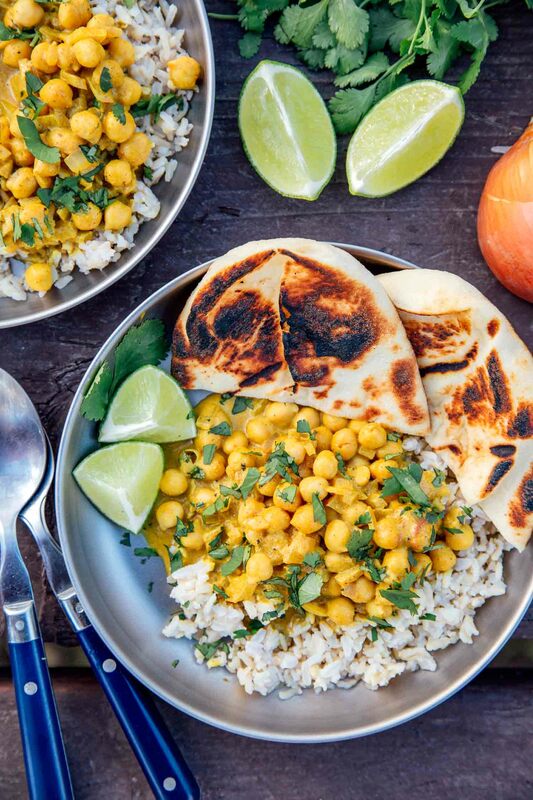 Packed with plant-based protein, completely filling, and loaded with flavor, this easy chickpea curry with coconut milk is sure to hit the spot! Heat the oil or ghee in a pot over medium heat and add the onions, sauteing until translucent but not browning. Add the Garam Masala, turmeric, ground ginger, cinnamon, and cayenne, and stir briefly toast the spices so they become fragrant. Add the coconut milk, tomato paste, and salt. Stir until the tomato paste is completely blended into the coconut milk, then add the chickpeas. Cook over medium to med-low heat, stirring frequently until the sauce thickens to your liking – 10 or 15 minutes. Meanwhile, prepare your sides (see serving suggestions). Serve the chickpea curry with a squeeze of lime, a dollop of yogurt (optional), and garnish with plenty of cilantro. Serve over rice or cauliflower rice. Rice can be made at home ahead of time and reheated, or cooked from scratch on the second burner of your stove. Toasted naan is another great side - warm pre-made naan over the open flame of your stove or campfire, turning frequently with metal tongs until browned.